MI: How long have you been tattooing? Joe: I’ve been tattooing for 20 years. I started out as amateur at 17, using homemade equipment and doing it the wrong way. It was a weekend hobby for 8 years before I did an apprenticeship in a tattoo shop and I learned how to do it correctly. MI: This was in Ukiah? Joe: This all started in Virginia where I grew up. I was living around the Norfolk area, where at the time it was illegal to have a tattoo shop. But there were shops within 100 yards of where I lived. MI: Who was the clientele? Joe: I had some sailors but mostly it was middle class people, people who knew me, or found me through word of mouth. I tattooed police officers. It wasn’t a serious crime. If I had gotten caught, I would have been fined $50 because I didn’t have a shop or a license. Most of these people were coming to me on someone’s recommendation—they had already heard of my practice. Even as an amateur, I was using brand new needles for every client. Joe: It originally grew out of my own drawing ability. I was drawing pictures since I was a baby. I always drew monsters, girls, motorcycles, typically boy stuff. I started looking at magazines, and pretty early on, 15 years ago, I started getting influenced by Paul Booth. MI: His work is so black and gray, very dark images. Joe: Not only visually dark, but emotionally dark. Usually involving murder and brain matter and what have you. MI: So how did you develop your own style? Joe: It wasn’t until I went through my apprenticeship that I learned how to tattoo the right way. The first thing I learned how to do was copy my boss, to do everything the way he does it. Once I had that down pat, I was able to infuse it with my own flavors, so to speak. What I do best is fine line black and gray, which was the style of the guy who taught me. I’m still very much his student, but I try to take it to my own level. MI: Who are artists you admire? Joe: Robert Hernandez, a really phenomenal tattoo artist from Madrid. In my honest opinion, he’s the best artist in the whole world. I try to emulate his techniques, texture, light, shadow, surreal subject matter. MI: How many people have you tattooed? Joe: The number’s probably close to 10,000. I can do the math…back in the early days when I was an amateur tattooer, I was busier. There were some days I would do 10 tattoos in a row. These days I do about 3 a day. MI: Incredible! Tell us about one of your favorite tattoos. 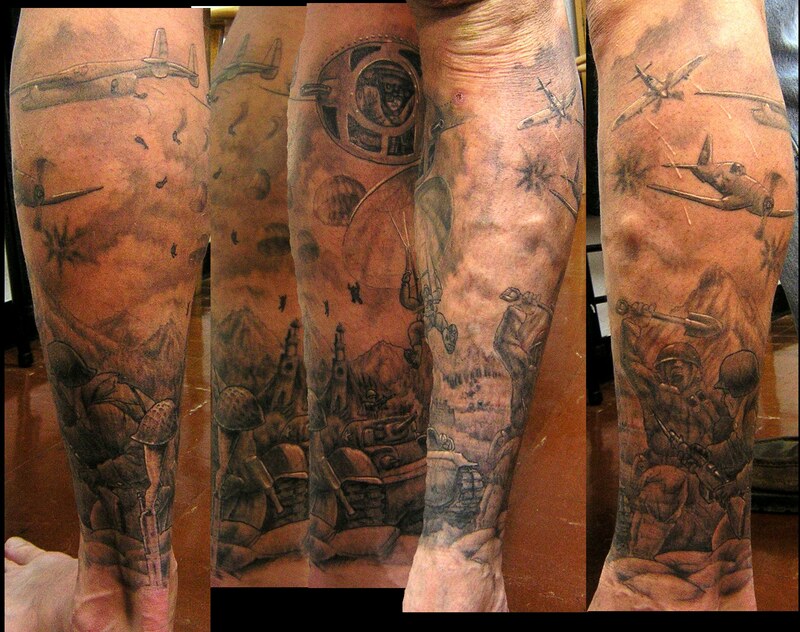 Joe: Probably one of my favorite tattoos of recent times is the WWII scene I did on a guy’s leg. But I have a new favorite tattoo every 6 months because I keep outdoing myself. I haven’t quite hit my plateau in terms of my skills. MI: So was this person a veteran? MI: It’s definitely a detailed piece, with a lot going on. Joe: I used a little bit of white to help accentuate the foreground pieces—it’s to separate things and create the illusion of depth. MI: Never heard of using white ink in that way! Joe: The white ink is mixed into the foreground elements. You think they’re jumping out at you because they’re slightly different. It’s not like you notice the white since it’s mixed in. MI: Your work is phenomenal and it’s great to see that you recently submitted a design, “Repent,” to our design contest. Out of curiosity, as a tattoo artist, are you able to tell which designs in our contest were drawn by fellow tattooers vs graphic artists? Joe: Only to some degree, because more and more graphic artists are coming into the tattoo industry. MI: Well, if you have an artistic bent, it’s all you need! Good luck with “Repent” and for all our readers, please support Joe by casting your vote for his design on metalinkshop.com! *Winning designs are printed on t-shirts, and designers are awarded $700 cash, $300 store credit, plus residuals from t-shirt sales on metalinkshop.com! This entry was posted on January 15, 2010 at 6:07 pm and is filed under Designer Interviews, Tattoo Artist Interviews with tags design challenge, Joe Drache, Metal Ink designer interviews, Paul Booth, tattoo artists. You can follow any responses to this entry through the RSS 2.0 feed. You can leave a response, or trackback from your own site.